Want to See McKinney the Cool Way? Hop on a Segway! Segway tours have been popular in big cities for a few years now and, thanks to Jen and Ken Smith, Segways have come to McKinney! Visitors to McKinney (and residents, too, of course) can tour the city’s historic district, parks and more atop these two wheeled electric vehicles, thanks to the Smith’s company, McKinney Segway Tours which officially opened Sept. 4. Both the downtown historic tours and parks are open for reservations. McKinney Segway Tours also offers customized tours as well for special events or circumstances. “We’ve been thinking for years of something different to do, and of all the ideas we explored, every step along the way with the Segways has just worked out just as it should,” Jen said. The couple talked about the desire to eventually offer adventure tours while on the road, either that or start other Segway tour businesses in other smaller cities. But first, they’re working to get McKinney Segway Tours launched. They’ve already formed a partnership with Munzee Marketplace for their downtown tours; tour participants meet the Smiths at this store for signing releases and pre-tour instruction. They will also hold special tours for Munzee players in town in October for the company’s MHQ Bash. 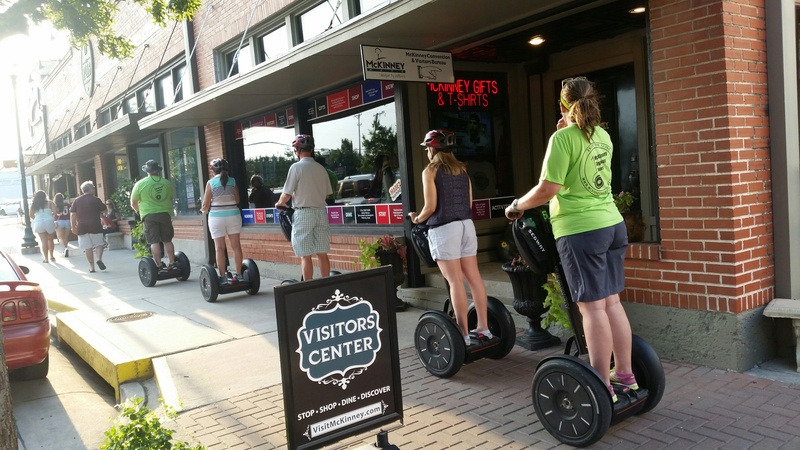 Currently, McKinney Segway Tours can tour up to five people at one time. (“Right now, the streets and sidewalks here won’t handle more than that and we don’t want to get in anyone’s way,” Jen said.) If the need arises, especially for special custom tours, they do have the option of renting other units from the Segway tour company in Dallas with whom they’ve been consulting on starting their business. For more information about McKinney Segway Tours and to check their tour schedule, visit their website.